So much of this life is about choices. Choosing to love, to forgive, to be patient, to be kind, to be happy, and the list goes on and on! Today I want to tell you a little about where my thoughts have been lately. Perhaps you've noticed that I haven't been blogging as frequently as usual. I went through a few rough weeks which led me to spending a lot of time thinking about things and life in general. 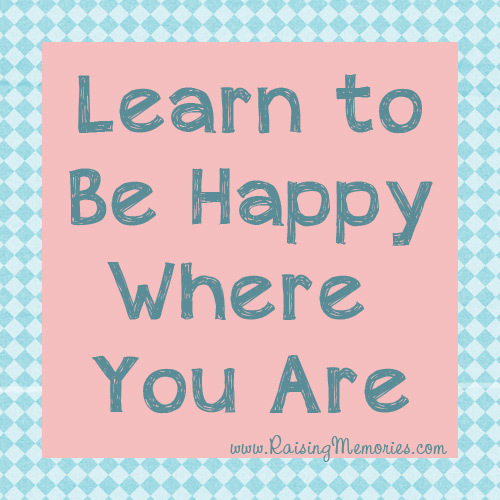 Just over a year ago, I published a post on this blog about happiness and being happy where you are. I wrote about how we had expected Ken to be finished his PhD and started on something new in time for the girls to start school in the Fall of 2013. When I wrote that post (a year ago), I said that things took longer than expected and we were then hoping for a finish date for his PhD in July (of 2014). In that post, I wrote about how focusing on the future can make the present feel like "not enough". It's interesting that I was dealing with those feelings a year ago, because now, a year later, I have been dealing with them again and struggling to remind myself of what I felt I had figured out a year ago. Last week, Ken & I drove to Toronto together to hand in his thesis. I am so excited that we have hit that milestone! We are still at least a couple of months away from his defence and are hoping for a finish date by the end of this summer, but little things keep happening to make things take a little longer and a little longer. It can be difficult not to focus on that end date when it has slipped away from us and been postponed so many times over the last 2 years. I tell you all of this, to give you some background before explaining some things that I have taken away from a book I've been reading. 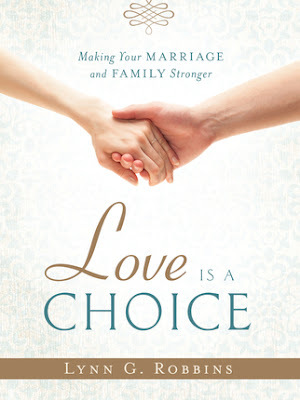 When I agreed to review a new book called Love is a Choice by Lynn G. Robbins, published by Deseret Book, I was expecting a good book that would put things in perspective and give me ideas for how to strengthen my family. That's exactly what I got, but I also got a lot of encouragement for dealing with this stage in my life where I am finding it a challenge not to be dragged down by circumstances that are not what I expected or hoped for. There is a chapter in the book called, "Choosing Happily Ever After" that talks about the power of choice. It uses an example of three brothers who face the same situation in life. Two of the brothers are constantly complaining about their less than desirable circumstances. They are so cynical and pessimistic that their misery becomes a self-fulfilling prophecy. In contrast, the other brother chooses to recognize the blessings in the same circumstances. (If you've read the Book of Mormon, you'll recognize the brothers in this story as Laman, Lemuel, and Nephi). "Patience: the quality of being patient, as the bearing of provocation, annoyance, misfortune, or pain, without complaint, loss of temper, irritation, or the like." These little things make a lot of sense, and I'm sure they're not new ideas to me or to you, but sometimes just hearing them at the right time, or thinking of them from a slightly different angle can make for an epiphany. The book has a section at the end with resources for making the choices discussed in the first half of the book. This includes a section of FHE (Family Home Evening- or Family Night) helps with a ton of ideas for how to teach your family. I really liked it, and it also has a section with a list of 100 Christlike Virtues and then tells you how you can make them into subjects for a Family Night lesson or use them as a jumping-off point for your own study. Regardless of the stage of life you're in - whether you're engaged to be married, have children, or are single, this is a great book to read. It applies to so many different areas of life. I found great ideas for how to teach my children, how to approach disagreements as a couple, and how to deal with personal struggles. Have you ever thought about happiness or love as a choice? Is there something that helps you to be happy when things aren't ideal? Disclosure: A copy of this book was provided for review purposes, but this is not a sponsored post and all opinions shared are, as always, my own. Thanks Bonnie! I just looked up your post about Marriage & Happily Ever After- it's great! I love you and I love this post! Happiness is for sure a choice! its just a harder one to make sometimes! I love you too! Thank you Robin. That's very true. Oh man, just reading your comment makes me miss you- I hope we get to see each other again soon! I believe in choosing happiness and love. It makes a huge difference when you "choose" to live life like that :) Beautiful post! Happiness is always work, I've always thought that. Sounds like an interesting book. Sounds like a great book! I do believe that remembering that happiness is a choice is a good way to keep things in perspective when going through a tough time. I also struggle when things don't turn out the way I planned or expected, and those are the moments I need to remember that I am in control of my emotions and reactions. I agree. It has been making a difference for me! I've been married for 38 years. We were married when we were 18/19. That's so young! After the first flush of romance ebbed down, we worked at making our marriage successful. We struggled and once, for a period of about 10 years, I thought we weren't going to make it. Once we made it a decision to be in love and to make that choice, things were so much better! I'm glad you "figured that out"! That must have been a difficult decade! It's very good to hear that you found a way to make things so much happier! Yes, to a degree- of course, it is most helpful if both people are making that choice! Sounds like a book I would agree with. My husband and I both think we have a happy marriage because we CHOOSE it. Good luck for your husband and the thesis. Sounds exciting to accomplish such a thing. I so agree with the essence of this. It's really our mindset which affects everything. We can't control circumstances, but we can definitely control our reactions to them. This sounds inspiring, I'm going to look this up. There is always room for more patience, but it is so worth it! I totally agree. Happiness is a choice and responding to a situation instead of reacting will have a huge impact on the outcome. I love these kinds of books, they're uplifting and emit pure positive energy.